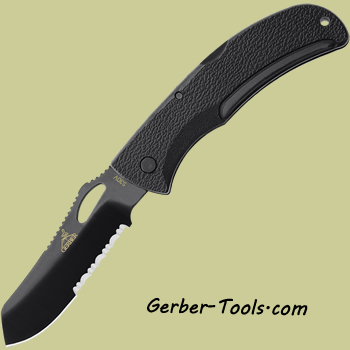 Gerber EZ-Out DPSF - S30V Black 22-01648G. If you are looking for a souped up version of the E-Z Out knife here it is. This knife has upgraded features, namely the mostly-serrated blade made out of American S30V steel. This practical folding knife utilizes a 3.5 inch blade and features a rugged polycarbonate handle that also has SoftGrip inserts. It has an overall length of 8 inches. Made in the USA. Get an EZ way out of chores and daily activities with your Gerber EZ Out.